BBC Radio 4 - More or Less: Behind the Stats, Is Mansa Musa the richest person of all time? In recent news reports, the Mali king Mansa Musa has been described as the richest person to have ever lived. But how can we know his true wealth? Mansa Musa, the 14th century Mali king, has nothing on Jeff Bezos - read one recent news report. Musa set off on a pilgrimage to Saudi Arabia in the 1300s and it’s said he left with a caravan of 60,000 people. Among them were soldiers, entertainers, merchants and slaves. A train of camels followed, each carrying gold. In recent reports, he has been described as the richest person that ever lived. He has been compared to some of the wealthiest people alive today. But how can we know the value of the ‘golden king’s’ wealth and can we compare a monarch to the likes of Amazon founder Bezos? 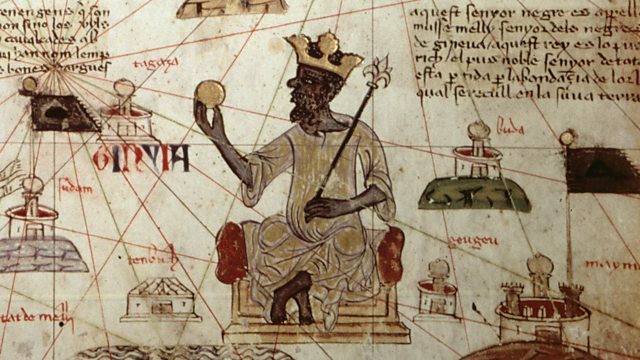 In this edition, historian Dr Emmanuel Ababio Ofosu-Mensah of the University of Ghana in Accra explains who Mansa Musa was and Kerry Dolan of Forbes talks to us about rich lists.